Greater Shepparton will host an array of Australia Day celebrations on Saturday, January 26th, including ceremonies, events and entertainment across Shepparton, Arcadia, Dookie, Mooroopna, Murchison, Tatura and Toolamba. Celebrations will feature flag raising ceremonies, guest speakers, Australia Day Ambasadors, entertainment and, of course, the presentation of the 2019 Australia Day Awards. Greater Shepparton City Council Mayor, Cr Kim O’Keeffe encourages all residents to celebrate what it means to be Australian. “Australia Day is a fantastic opportunity for all citizens, regardless of their background to come together to celebrate our country and what it means to be an Australian,” Cr O’Keeffe said. “I encourage all residents to take pride in their country on 26 January and reflect on who we are as a nation. 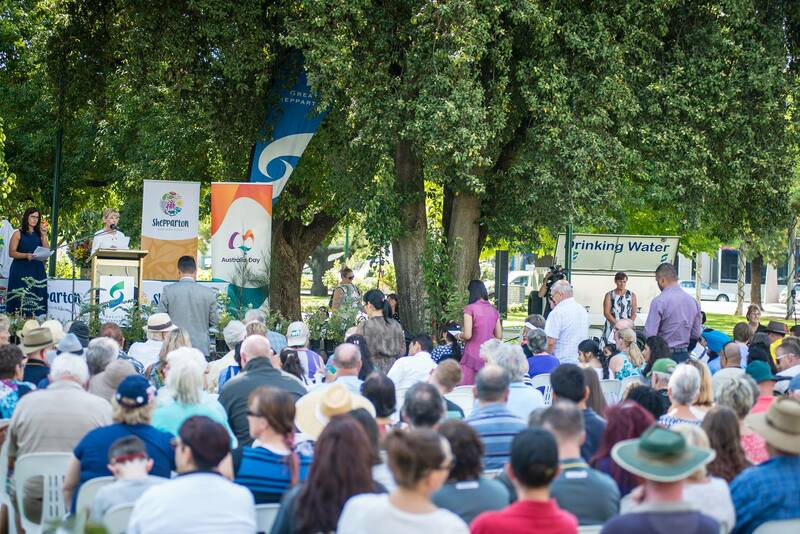 This year, Shepparton will be celebrating the 70 year anniversary of the first citizenship ceremony along with the Australia Day Award presentation. There will be a free BBQ and multicultural brunch available along with musical entertainment and children’s activities. Dr Peter Ellyard is a futurist, strategist, speaker and author who lives in Melbourne. Peter assists individuals, companies, communities and nations to develop pathways to success in the emerging 21st century interdependent global society. He has held CEO positions in a number of public sector organisations over 15 years including two associated with Environment and Planning, and one with Industry and Technology, and was also Chief of Staff to a Federal Environment Minister. Peter has been a Senior Advisor to the United Nations for more than 30 years including the 1992 Earth Summit where he was a senior advisor on both the climate change and the biodiversity conventions. A free breakfast will be held with attendees. Deepak Vinayak is a committed community worker with more than 17 years’ experience in volunteering and leading activities in the multicultural, multi-faith and regional communities in Australia. He has actively engaged with newly-arrived migrants and has helped them settle through language support and career guidance. Deepak was awarded the Medal of the Order of Australia in 2018 for his work promoting multiculturalism in Victoria. As a Justice of the Peace (JP) and a two time People of Australia Ambassador, his work has given him immense pleasure in connecting with volunteers, community, political, and faith leaders to promote peace, unity and happiness. The Dookie Lions Club will provide a free cooked breakfast where the Australia Day Awards will be presented. There will be Australian themed music, gifts for children and time for people to meet, mingle and enjoy the day. AFL coach, elite athlete, media personality, entrepreneur and successful businessman, Stan Alves’ multifaceted ability has taken him from the elite sporting arena and into the business world. Stan played 283 games with Melbourne and North Melbourne football clubs, and has been awarded AFL life membership in 1994, he was appointed coach of the St Kilda Football Club where he took the club to two final series and got them to their first grand final appearance in 26 years. Outside the football arena, Stan was Company Director of a financial planning firm that employed 40 investment advisors. There will be a flag raising ceremony to open the Mooroopna Australia Day Award presentations which will then be followed by a sausage sizzle and entertainment from local musicians and a bush poet. Diane James AM is a company director and business consultant. Her career includes establishing two start-up companies and numerous appointments to State and National board roles. She is currently Chairman of both Goulburn Murray Water and Southern Rural Water, Chairman of the Order of Australia Association in Victoria, and was a founding director of GenU, a national disability, ageing and lifestyle services organisation. She campaigned strongly for Victoria's first Marine Protected Areas, which saw the world's largest system of marine national parks proclaimed in 2002. In recognition of her contribution to the environment and natural resource management, Diane was awarded a Member of the Order of Australia (AM) in 2011. Attendees will be able to enjoy a bbq breakfast followed by the presentation of Australia Day awards presented by special guest Sara Niglia. Sara Niglia is a local face growing up on a dairy farm in Dhurringile. Working in the teaching profession she has had opportunities to teach at various school and institutions in the Goulburn Valley region. Now at 26 years old is now a full-time employee at Kew High School as a Mathematics Teacher and Leader of STEM (Science, Technology, Engineering and Maths).Through her work, she aims to inspire girls of today to aspire to careers in the STEM field where there are a shortage of women. Her passions for fitness lead her to start her own business, Shepparton Weightlifting Club and coach local athletes to an international level. Last year she was awarded Murchison’s Young Citizen of the Year which was a platform for her to help inspire local youths around the region. WHERE: Tatura Italian Social Club. WHEN: 8.30am Guests will be able to enjoy a free breakfast held in the morning before the presentation of the Australia Day Awards commences, which will then be followed by morning tea will to conclude the ceremony. Peter Moar’s parents, Dominic and Alma emigrated from Italy and became the station master at Tatura were peter was born. He attended Notre Dame College where he was School Captain and played cricket under Frank Howley. Completing an engineering degree at Latrobe University, he then progressed to Australian National University with a focus on advance telecommunications. His career took him to Germany spending five years designing satellites to detect fires and floods on a global scale. This led to Latrobe University co-designing the German Space Centre, DLR Earth Sending Imaging Spectrometer which is now running on the International Space Station, providing vital imagery for emergency services around the world. Australia Day awards will be presented followed by a free bbq at the end of the proceedings.